Toward the end of the last ice age, Earth’s climate was a turbulent beast, warming up and chilling out again every 1,500 years. Research published today in Science links these abrupt temperature swings to changes ocean circulation, filling an important gap in our understanding of past climate change. Scientists have long debated the impacts of ocean currents on Earth’s climate. In particular, there’s a great deal of interest in what happens when a conveyor belt of currents known as the Atlantic Meridional Overturning Circulation (AMOC) slow down or speed up. These currents, which drive the Gulf Stream today, bring warm surface waters to the north and send cold, deep water back south. 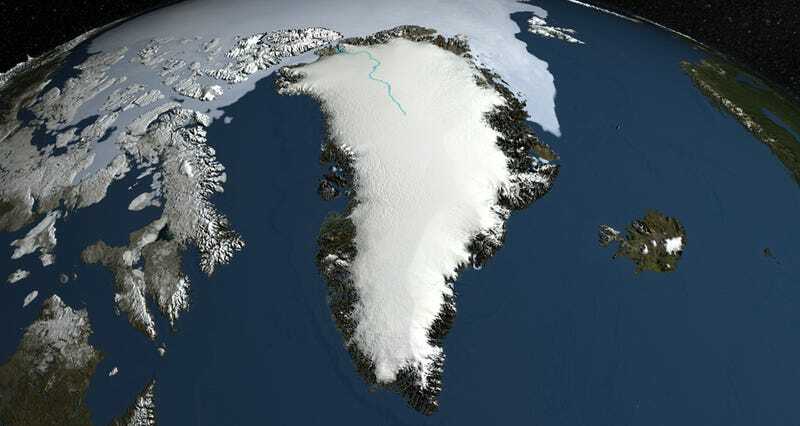 One theory about the ocean-climate relationship, popularized by the movie The Day After Tomorrow, holds that if the Greenland ice sheet melts, a vast sheet of freshwater will pour into the north Atlantic, floating atop the denser, heavier seawater, and disrupting AMOC. The transport of heat from the equator to the North Pole would shut down, and the northern hemisphere would plunge into an ice age. The Day After Tomorrow is by no means a scientific movie. But the idea that inspired it is supported by climate models, and it lies at the heart of a vigorous scientific debate over what sorts of feedbacks might be triggered by present-day global warming. The new study, led by researchers at the Columbia Earth Institute, offers some of the firmest evidence yet for a link between AMOC and global climate during a much cooler chapter of Earth’s history: Marine Isotope Stage 3 (MIS3), which lasted from 60,000 to 25,000 years ago. To find out, Henry and his co-authors obtained a 40-meter (130-foot) sediment core from the Bermuda Rise, a region of the Atlantic seafloor that offers a high-resolution record of past climate change. By studying chemical tracers and microfossils within the core, the researchers built a detailed chronology of AMOC during MS3. And they discovered a striking pattern: every single instance of global cooling was preceded by a slow-down of overturning circulation. In some of the most dramatic cooling episodes, overturning circulation seemed to come to a standstill. Henry emphasized that while his research finds a correlation between AMO and climate change, it can’t attribute causation—in other words, something else could be causing both. But it certainly supports the idea that ocean circulation and climate were linked during the last ice age.